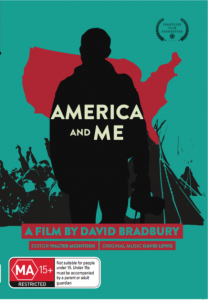 A filmmaker’s critique of the American penchant for Empire. lead up to the shock election of Donald Trump, 2016. Bradbury was filming the native American Indian protest at Standing Rock when America woke to the news. of its people…and exploiting the resources and labor of other people to its greater gain. America and Me chronicles how the hawks have come home to roost in the nest of America itself, 40 years after Ronald Reagan championed the economic theories of Milton Friedman and his infamous Chicago Boys. Bradbury uses telling moments from his earlier films shot on the edge of the American Colossus – Nicaragua No Pasaran, Chile Hasta Cuando? (Pinochet’s dictatorship), Frontline (about the Vietnam war) and South of the Border (the New Song movement and radical politics versus dictatorship in Central America), to give context to his critique of the American penchant for Empire.